Cone snails have inspired humans for centuries. Coastal communities have often traded their beautiful shells like money and put them in jewelry. Many artists, including Rembrandt, have featured them in sketches and paintings. 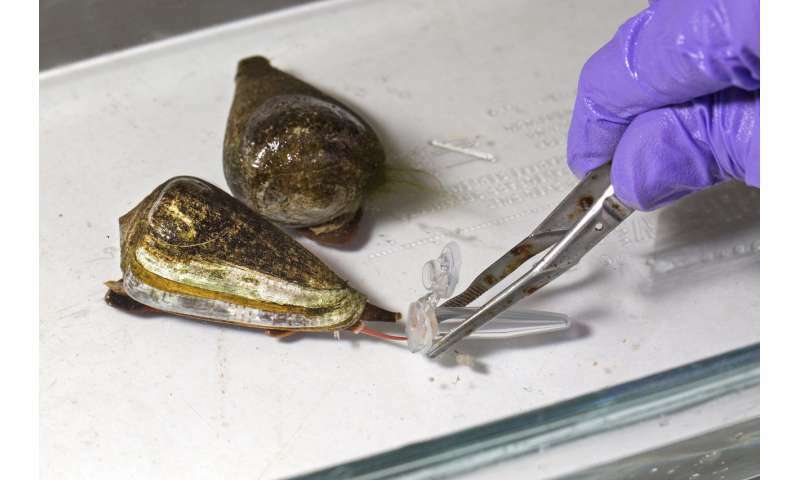 Now, scientists at the National Institute of Standards and Technology (NIST) are finding these deadly predators inspiring, too, as they seek new ways to cure old medical problems using the poisonous snails as models. "This is the same venom used to kill dinosaurs in 'Jurassic Park,'" says NIST biochemist Frank Marí, with a chuckle. "It is scary stuff, but that power could be used for a different kind of good in real life." Like all NIST scientists, Marí measures things. Specifically, he measures RNA and the associated proteins at work inside marine animals. As technology has improved over the years, he and his team have become better able to examine, analyze and catalog the molecules at work in some of the ocean's lesser-known creatures, including cone snails. This year, his lab made several significant discoveries about their venom, discoveries that might ultimately lead to the development of new medicines for hard-to-treat diseases. By imitating the way that these small, quiet creatures deliver poison, scientists may be able to better deliver cures. On any given day, Marí can be found walking up and down the rows of burbling aquarium tanks at the Hollings Marine Laboratory in Charleston, South Carolina, checking on the 60 individual cone snails that have lived in his lab for the past 15 years. Once a week, he and his staff make a kind of delicate negotiation with them, trading a dead fish for a dose of poison to be gathered in a tube and stored away for use in ongoing scientific measurements and investigations. "Cone snails are so unusual," Marí says. "They are not really like any other creature on Earth, and working with them is almost like working with an extraterrestrial. But that's also fun. The cone snail system is like a candy store to someone like me." More than 800 species of cone snails have been found worldwide, mostly in warmer, tropical areas. They are reclusive, faceless creatures and not aggressive, but will sting defensively when picked up by an unwitting shell collector. The smallest cone snails impart a sting that is about as powerful as a bee sting, but the sting of larger species can kill an adult human in a matter of hours. The deadliest cone snail is thought to be the "cigarette snail" of the Indo-Pacific, a snail roughly the length of a man's thumb that can deliver a toxin so strong that you'd only have time to finish one cigarette before dying from its attack. Although his collection includes several species, Marí's special area of focus is the purple cone snail (Conus purpurascens). It's a creature mostly found in the Eastern Pacific coastal waters off the Gulf of California down to Peru and offshore around the Galapagos Islands, slowly moving along the rocky bottom where it grows to be a few inches long. Like all snails from the Conus genus, these nocturnal animals are common, but often go unseen by casual beachgoers. Despite their own slow tendencies, these snails have evolved to skillfully hunt far speedier animals in the dark by firing a single harpoon-like tooth into other snails, fish and worms. Once injected, the prey becomes instantly paralyzed and unable to make a getaway. The snail then slowly pulls the immobilized meal inside its shell to be digested, whole. Each tooth is discarded after use and immediately replaced by another. Some cone snails travel with 20 or so of these teeth embedded in their systems, loaded and ready to be fired off when the next meal happens to swim along. In its native state, cone snail venom would obviously not make a great treatment for human ailments. But by unpacking it bit by bit and measuring each component on the molecular level, Marí and his team aim to understand and catalog how each aspect of this poison does its job. "There's a lot we are just learning about them," Marí says. Why, for instance, is cone snail venom able to penetrate another animal's nervous system so quickly? And how does it paralyze a victim so effectively? Even more puzzling, some individual purple cone snails are not toxic at all, which Marí thinks might be related to stages of development in the snails. The answers to all of these cone snail questions could be used to create new medicines that move through a patient's body in a quicker and more efficient manner, such as new types of insulin for the treatment of diabetes or better treatments for neurological diseases like Alzheimer's. Some think venom research can provide new delivery systems for drugs that would aim to curtail quick-spreading forms of cancer. Others want to use the venom's ingredients for the treatment of addiction. One component of cone snail venom has even been used in anti-wrinkle creams now on the market that put the power of inflammation to work under the skin, puffing out creases and fine lines on human faces. For a paper just published in Scientific Reports, Marí and his team used cone snail toxins as molecular probes to identify an important overlap between the immune and central nervous systems in humans. Their work demonstrated for the first time that a classic toxin—one usually associated with the central nervous system—can also have an impact in the immune system, whereby some cells are signaled in specific ways once certain kinds of cone snail peptides, known as conotoxins, enter the body. The new information may aid in the development of therapies for eradicating gastric, breast and lung cancers, as well as in the control of tuberculosis, since all of those illnesses trigger overproduction of some cells. Rather than using the toxin as an actual cure, the work would provide a road map for better understanding (and maybe controlling) the growth of undesirable cells. For another study published recently in the Journal of Proteomics; and his team worked on the isolation and characterization of an enzyme in the cone snail venom called Conohyal-P1. They used an ultrahigh-resolution mass spectrometer, one of the most powerful tools available to identify and count proteins in a sample. A similar enzyme is found in both lionfish and bee venoms. Surprisingly, it is also found in many kinds of mammalian sperm, where it helps to weaken cell walls of ovaries and facilitate entry of the sperm and successful reproduction. "We knew that this enzyme was able to break down extracellular tissue," says Mari, referring to the outermost membranes of cells. "We now have been able to carefully evaluate the activity of the enzyme for anyone to use in future work. In addition, we have identified a new subtype that had not been known before." In a third paper, published recently in the journal Neuropharmacology, Marí and his team evaluated toxins in the cone snail venom by testing them on the central nervous systems of fruit flies. Although the fruit fly is very different from humans in many ways, its central nervous system can provide a great model for a wide variety of medical studies because the basic structure of cells in fruit fly brains is similar to the structure of cells in human brains. So, if a fruit fly brain cell reacts one way, scientists know a human cell will, too. Marí's team specifically wanted to know how conotoxins interact with a variety of molecular targets in the nervous system of their prey. Purple cone snail venom contains a large number of these protein building blocks, more than 2,000 of them. "The venom is incredibly complex," Marí says. "We wanted to answer the question: which parts could be used as medicine?" In this case, they found that the flies' response to injections of cone snail venom primarily took place in the receptors that govern muscle movement and addiction. Such details could be useful in the development of new drugs for Parkinson's disease, which often ravages the muscular-skeletal system, impairing a patient's ability to control basic body movements. It might also help with the development of effective nicotine addiction treatments. "The pattern on a cone snail shell is very beautiful," Marí says. "But I think the biology and biochemistry are even more beautiful, and as we explore all the different aspects of the venom, we can open all kinds of new opportunities for medical use. We are finally able to crack the code." these snails have evolved to skillfully hunt far speedier animals in the dark by firing a single harpoon-like tooth into other snails, fish and worms. Once injected, the prey becomes instantly paralyzed and unable to make a getaway. The snail then slowly pulls the immobilized meal inside its shell to be digested, whole. Each tooth is discarded after use and immediately replaced by another. HOW did the skill, digestion and replacement "evolve" thru pure accidental means? Nobody is saying because no one was there to observe and record such miraculous development. Hence one cannot call that statement scientific in any way or form. It's pure speculation. Swallowed hook line and sinker by the adherents of the current paradigm.